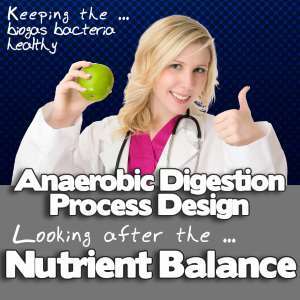 The balance of nutrients is crucially important to all biological processes. If any nutrient is absent or in low supply, it may become process rate limiting. In some cases the lack of particular nutrients may reduce the stability of biological processes, or result in organisms being present in the biomass which are inefficient for the process, or to the detriment of the process, and proper treatment. Of course, any reduction of the rate to methane production has serious consequences for plant throughput and economic operation, so these considerations are very important. There are normally considered to be two types of nutrients in biological systems, and these are the major nutrients, of which quite large quantities are needed, and micro-nutrients which need to be present at much lower levels, but which if absent can be equally important. The major nutrients required by the bacteria are ammonium and phosphate. The optimum range is, typically reported to be around 5kg per tonne of organic matter for nitrogen, and lkg phosphorus per tonne of organic matter destroyed. There are normally plenty of proteins present from the decomposition of household waste so there is not usually a shortage of ammonium ions, but some additional phosphate may be required to ensure optimum process rates. The micro-nutrients which methane bacteria require in trace quantities include: iron, manganese, copper, nickel, zinc and cobalt, all of which are likely to be present in MSW. Although MSW may contain toxic metals which are not needed in any quantity at all, include cadmium, chromium, mercury or lead. The bacteria tend to be protected from excessive concentrations of these metal salts by the action of sulphate-reducing bacteria which tend to precipitate “surplus” metal ions as their insoluble sulphide salts. If required, sewage sludges and animal slurries can be added to the feedstock to provide a useful source of all the “major and micro” nutrients required by the anaerobic digestion bacteria. pH and Alkalinity are closely linked. As alkalinity drops the pH will also fall. Methane bacteria will grow at all pH values between 6.0 and 8.5 with an optimum slightly above pH 7.0. A minimum alkalinity of about 500 mg/l is required to neutralise the acidity of the dissolved carbon dioxide gas and to form a buffer of the within the optimum pH range. Higher alkalinities are sometimes helpful, especially during start-up, to neutralise the initial acidity of a larger than normal level of volatile fatty acids, until the contents of the reactor “age”. A major source of alkalinity is ammoniacal nitrogen which is released by cell lysis (the breakdown of cell proteins) in the MSW. The concentrations of ammoniacal nitrogen are high and often in the 1000-4000 mg/l NH4N range. The release results in pH values in the range 7.5-8.5, which is naturally suitable for the fermentation process. The methane bacteria in sludge digesters and landfill sites are in principle likely to be derived from freshwater species so there is a limited to their ability to tolerate the high salinity build-up in the added process water if excessive re-circulation of process water is used. Optimum and inhibitory concentrations of some common salts are reported by McCarty, (1964) (See our references page). Calcium and magnesium salts are also present in the MSW but inhibition unlikely as their maximum concentrations are limited by their solubility, and in anaerobic digesters, they tend to precipitate before they reach inhibiting concentrations. Overall reaction rates and hence plant throughput can only proceed at the pace of the slowest in the chain. Reaction rates are generally limited by the slow growth of the methanogens – those “methane bacteria” that convert acetic acid to carbon dioxide and methane. Both mesophilic and thermophilic strains of methane bacteria can be used in anaerobic digestion processes. Mesophilic methane bacteria grow best at 35-40°C, and thermophilic methane bacteria grow best at 55-60°C. For simplicity of operation and to avoid the need to heat the reactor, most anaerobic digestion plants are operated at mesophilic temperatures that at temperatures between 3°C and 35°C and require 15 to 20 days of mean retention time in the digestion reactor to produce a reasonably high methane gas yield and a high quality digestate product. The thermophilic reaction rate can be more than double the mesophilic rate, in theory, so it may be chosen to reduce vessel size. Traditional anaerobic digestion for sewage sludge treatment has most often used the mesophilic range. However, there has been a trend for the high solids contents available from MSW to use the more rapid (10 to 15 days) fermentation at thermophilic temperatures of 55°C to 60°C. The reduction in reactor size may be attractive, especially if the plant includes a CHP provision, as the waste heat from the utilisation of the methane, can then be used to heat the reactor. The temperature attained during thermophilic provides a much better sterilisation of weed seeds and possibly also of “pathogens”. In countries which have regulations which seek to ensure biological security (eg the prevention of the spread of such vectors as the “Foot and Mouth” Disease in cattle), higher temperatures than in the mesophilic process are required for sanitisation. In such regulations as in the EU’s Animal By-Products (ABPR) regulations, the thermophilic choice, if well controlled can, with attainment of the top temperature demonstrated by monitoring, provide intrinsic compliance. This should be compared with the mesophilic process choice which will always normally require an additional stage of separate pasteurisation of the liquid (fertiliser), and possibly also of the solid by-products. The contents provided here are for general reading purposes. None of the statements made on this web site are provided for the purpose of plant design or for making investment decisions. In the event of commercial use of this nature the web site reader shall always obtain professional advice. There is a lot here on nutrients. Useful and ” unique” article post. Just had to comment on it! Fantastic. Wonderful web site. Plenty of useful information here. IÂ¡Â¦m sending it to a few buddies ans adtliionaldy sharing in delicious. And of course, thanks to your effort! I would just like to point out that although gas production and “energy potential” typically dominate the thinking in the anaerobic digestion techn world today. This emphasis may, in the future, look incredibly naive, while benefits of residues and nutrient management from AD are ignored. Do you not think, making best use of AD residues should be a priority right now? For example, the value of properly managing nutrients, such as phosphorus, can easily make-or-break projects. They should not be discarded as being uneconomical, based on energy production value alone. Adding the right nutrients as needed is a high skill. Choose a company working with owners and operators as they manage and maximise energy production. There is no doubt that attention to nutrients pays-off, and solutions should be easy to administer, cost-effective and lead to optimal output. Anyone here know a good lab which knows how to interpret nutrient requirements from chemical analysis reports? Keep up the good work on this website.